Thread: what happened to the chat?? there is a chat on animeglobe.com and animegalleries.net and tuxedomask.com. You can log into it through there if thats what you mean O_o; animeforum.com will have a chat page soon, and it will go into that same chat. animeglobe forum isn't coming back O_o; the chat tho' is. 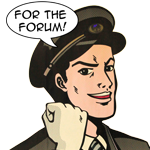 You can still log into the chat from the animeglobe forum, but we will soon have a login on here for it as well.